A dangerous animal commonly found around the Iliac Bay. It attacks with its two very long incisor teeth and both front paws. Nobility sometimes train them as house pets. Sabre Cats are large, powerful, and fast cats that have evolved two dangerously sharp front teeth. They are very dangerous and will attack wildlife and people without hesitation, often ignoring the former in favor of the latter. They're found in the wilds of Skyrim. 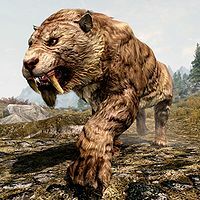 Khajiit legend states that the sabre cats were once the Rhojiit, Khajiit warriors who fought for Alkosh at the Battle of Red Mountain. 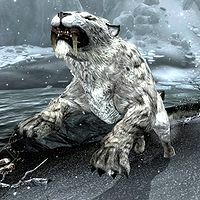 Snowy sabre cats are found in the frosty high elevations of Skyrim, and vale sabre cats can be seen in the Forgotten Vale. 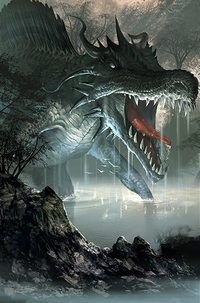 Salamanders are large, hostile amphibians found throughout Summerset. They attack using various elemental abilities, as well as their long tongues and tails. 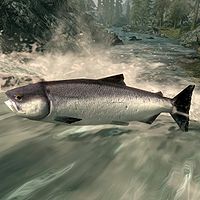 Salmon are gray fish commonly found in bodies of water around Tamriel, and are often seen jumping to ascend waterfalls and rapids. While the other species of fish tend to swim near the surface of bodies of water, salmon may often be seen either near the surface or in the depths. Its pinkish-orange flesh is a popular food source, and can be eaten raw or salted and cooked. A type of eel that can be found in the Alik'r Desert region. A type of fish that can be found in Bangkorai. 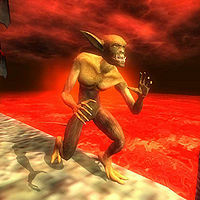 One of the lesser sentient Daedra of Oblivion, Scamps often enter into the mortal world to cause mischief and carry out errands for their Princes. They are weak, rather unintelligent, and cowardly, and are easily defeated except in large numbers. They are most commonly associated with Mehrunes Dagon. 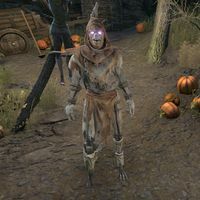 Scarecrow Spectres are scarecrows animated by a ghost. They are created by hedge wizards during the Witches' Festival, a holiday that takes place on the 13th of Frostfall each year. 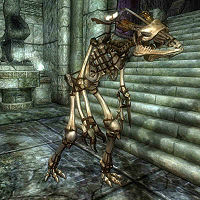 The dark magic involved in their creation is thought to be related to the spells that transform spriggans into lurchers. 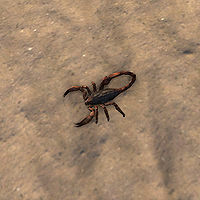 Common scorpions can be found in the desert. See also: Giant Scorpion. A type of fish that can be found in the sunny waters of the Gold Coast. Scribs, also known as squibs or kwama scribs, are the larval form of the Kwama. They are not very aggressive, but can paralyze attackers. A scuttler is a small two legged lizard, somewhat similar to the Alit. 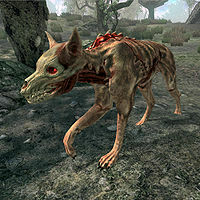 They are often kept as pets throughout Tamriel. A sea monster native to Pyandonea. They are tamed and ridden (or occasionally summoned) by the Maormer to support their navy. This is only possible because of the magic of their king, Orgnum. 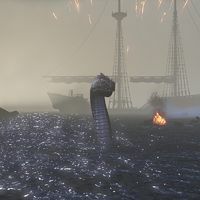 The skeleton of serpent was found in the sands of Stros M'Kai circa 2E 864. Seekers are grotesque tentacled daedra. They are servants of Hermaeus Mora, usually guarding tomes of forbidden knowledge. Seekers have the power to banish prey with sound attacks. They are rarely seen outside the Apocrypha. This article is about the animal. For the Khajiit furstock, see Senche (Khajiit). 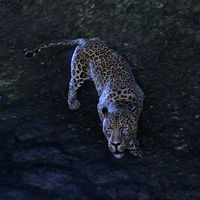 The Senche is a large, quadrupedal feline found in Elsweyr and Valenwood. Variants include Senche-Tigers, Senche-Panthers and Senche-Lions. The term is also used to describe the Senche and Senche-Raht breeds of Khajiit, but they are not actually related. 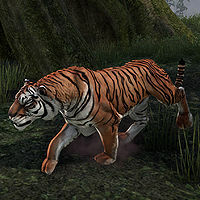 Large quadrupedal felines found in Elsweyr and Valenwood. Known to be used as steeds. They are of lesser sentience, but are still regarded as intelligent by the Khajiit. A type of fish that can be found on Summerset Isle. Winged snakes found in southern Hammerfell, particularly in the Hew's Bane peninsula. 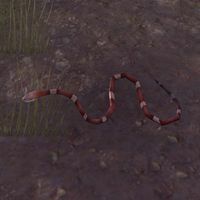 A type of eel that can be found in Cyrodiil. 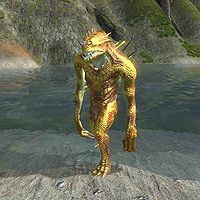 Shads are small fish that can be found in lakes across Tamriel. They are used as bait to catch larger fish. A type of fish that can be found in Shadowfen during certain times of the year. Sentient shadows are the result of Nocturnal's shadow magic ripping a victim's shadow from their body and giving it sentience. Victims describe feeling a chill before their shadows are separated from them and then often the shadow turns on its former owner and may attempt to murder them or even may take their place. Shadows are a vital part of a person's anumus and the victim is severely weakened and should they not reabsorb their shadow and instead destroy it, the victim will permanently lose some of their power. 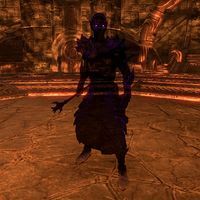 The most powerful beings such as those of the Psjiic Order, powerful mages such as Divayth Fyr, or even gods such as Sotha Sil can have their shadows ripped out of them. 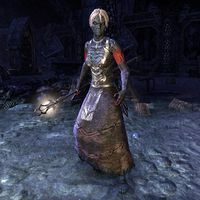 They have been shown to show intelligence and can even assume a person's role as seen in the second era where Sotha Sil's shadow took his place, although they are absorbed to be colder and arrogant than their actual counterparts. Shadows have a weakness to light sources. 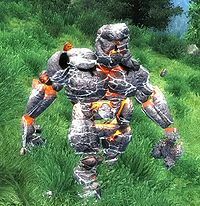 Shadow Atronachs are a type of elemental that, like other atronach varieties, can be summoned by a conjurer. Shalk are large and occasionally aggressive beetles which attack by 'spitting' magical fire. Despite the danger, they are herded by the Dunmer of the Deshaan region for their prized meat, resin, and carapaces. The Shambles appear to be some sort of undead construct made of bone and lashed together with wire or bits of cloth, often haphazardly. They detonate a magical ice bomb on death. A type of fish that can be found in Shadowfen. Shearteeth are a type of fish found in the Sump on Umbriel. They are described as having a "maw full of teeth". They can reach at least fifteen feet long and have long whip-like tails, dual swimming fins on the underside, teeth that "would shame a shark", and a tough hide. They are usually non-aggressive to Skraws but will attack if the sump considers someone an intruder. Domestic livestock all found in farms and sheepfolds. Very docile. A rare giant insect found underground in the Forgotten Vale of Skyrim. Shellbug chitin is very hard, making it ideal for use in crafting armor. 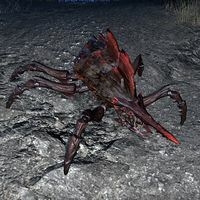 Harvesting the chitin requires the use of a pickaxe, with repeated mining of the shell causing its death. A type of fish that can be found on Auridon. Giant arthropods that are smaller than silt striders, or are possibly just the young of said creature. 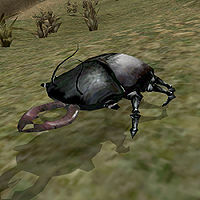 Used as a means of transport in Morrowind by the Ashlanders. Giant arthropods, which can be up to 60 feet tall. Used as a means of transport in Vvardenfell by manipulating exposed organs and tissues. It is said that their numbers dwindled due to the Red Year, when the eruption of the Red Mountain killed most of them and destroyed their native habitat. 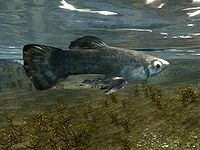 Silverside Perch are common fish that can be caught in ponds, lakes, and other bodies of water across Tamriel. A variety of humanoid Daedra with yellow skin in the service of Clavicus Vile. 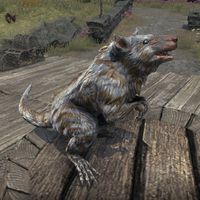 Barbas brought a number of Skaafin to Vvardenfell in 2E 583 to aid him in his plot to steal Vivec's power in order to locate and enter Sotha Sil's Clockwork City. A type of fish that can be found in foul water in the Rift. 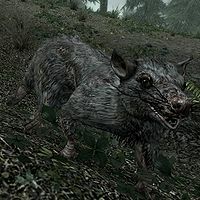 Skeevers are aggressive rat-like animals common to Skyrim. They are known to carry the disease Ataxia. 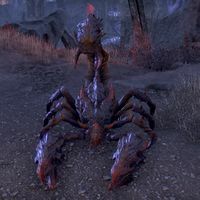 Skein Scorpions are Daedric imitations of Nirn's scorpion counterparts. 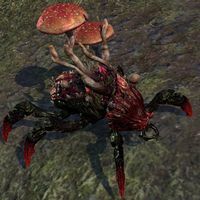 They are associated with the Daedric Prince Mephala.They are the preferred companion of Deathweavers, the Knights of the Spider Cult. 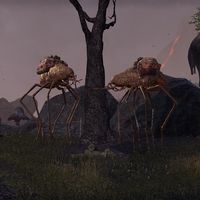 Skein Spiders are Daedric imitations of Nirn's spider counterparts. 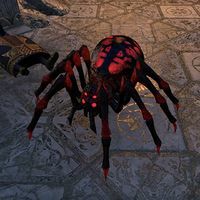 They are associated with the Daedric Prince Mephala, often being summoned by her Spiderkith minions. 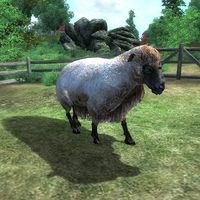 They are the most common denizen of the Spiral Skein and can be fiercly loyal pets. 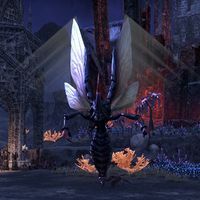 Skein Wasps are Daedric imitations of Nirn's wasp counterparts. They are associated with the Daedric Prince Mephala. Skeletons are the reanimated bones of the dead. They're often found protecting the dungeons, forts and ruins of Tamriel. Many varieties of animated skeletons exist, some stronger than others. Skeletons have a certain resistance to edged weapons and frost spells. 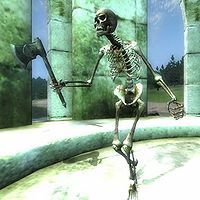 Though skeletons of humans and elves are generally the same, Orcs have different skulls due to their teeth, and beast races such as Argonians and Khajiit have different skulls overall. A type of fish that can be found in the Rift. Slaughterfish are small, hostile fish with razor sharp teeth found in the waters of nearly all of Tamriel. Their scales and eggs are prized for the alchemical properties. A type of shark that can be found in the sunny waters of the Gold Coast. A type of fish that can be found in Rivenspire. A type of eel that can be found in Grahtwood. A type of eel that can be found in Eastmarch. 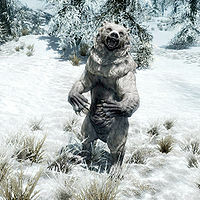 A white bear with an icy bite often found on the island of Solstheim as well as in the high mountains and icy plains of Skyrim. They are sometimes used as mounts. 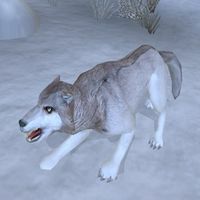 A small, white furred variety of Fox that can be encountered in the colder regions of Skyrim. Rabbits are one of their favorite prey. 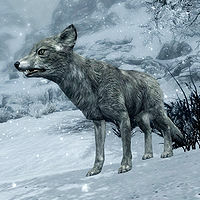 Some are kept as pets by Skyrim's inhabitants Their pelts are often sold by hunters and are considered more valuable than those of regular foxes. 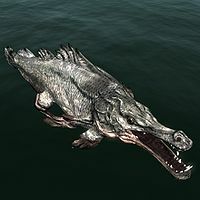 A type of common fish that can be found in lakes across Tamriel. The spirit of a Mudcrab. Can only be found in Gaiar Alata. Known to hoard enchanted items. The giant spider is a dangerous foe, not only for its damaging attack, but as it can also paralyze its victim so it can feed on them later. 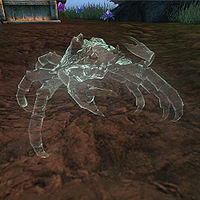 Large Frostbite Spiders are known to live in the caves and forests of Skyrim. 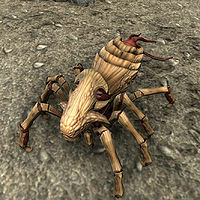 Also called Perthan, these Daedra appear as giant spiders with human torsos, and are associated with Mephala. They are so unruly and irrational that not even Mephala's worshippers will often summon them, for fear that they will disobey orders. 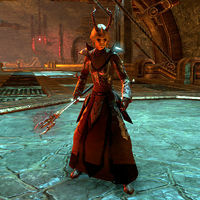 They are some of the more powerful Daedra, with formidable melee and spellcasting ability. They can summon Spiderlings to aid them in battle. 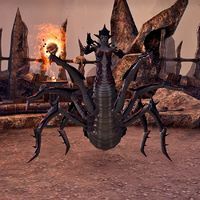 Spiderkith are navy-skinned humanoid Daedra in service to Mephala. A lesser Daedra that can be summoned by spider daedra to paralyze opponents. Spriggans, often called Nature's Guardians, are tree spirits that take the form of female humanoids. They possess moderate intelligence, but despite being revered they are usually hostile towards travelers. 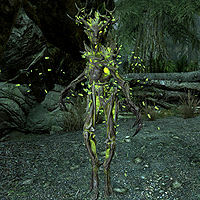 Spriggans have their own unique language, which can be learned by scholars and used to calm the creatures. 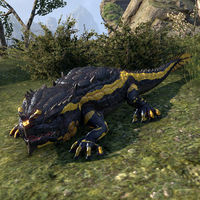 They are usually found protecting secluded glades and groves all over Tamriel, often blending in with the plant life and catching trespassers unaware. Spriggans attack with their long, sharp fingers as well as their teeth, and have the ability to poison enemies. They have incredible regenerative abilities, resulting in adventurers often having to defeat them several times before they remain dead. If threatened, they can call nearby woodland animals to aid them in battle, and some even have the ability to magically summon black bears. 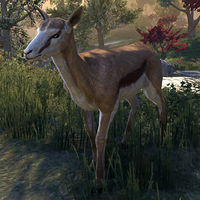 Passive deer-like creatures that can be found bounding all across Summerset. 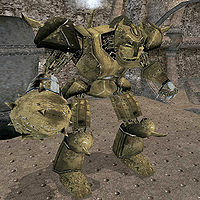 Steam Centurions (also known as Dwarven Centurions or Dwarven Mechanical Giants) are heavily armored constructs with an extendable mace on one arm. They are not as common in Dwarven ruins as the lesser Dwarven automatons. The book Ruins of Kemel-Ze implies that the constructs have a weakness to frost and magic attacks, due to the water/steam that drives them, although they are highly resistant against fire, frost and shock. The function of the Steam Constructor is unknown, but its name implies that it may have been used in aiding Dwemer construction projects. 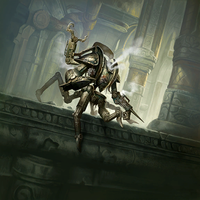 Its appearance is describable as a mashup of various automaton parts, including the legs of a giant Dwarven spider, the upper body of a Dwarven centerion, and various other Dwarven parts mixed in. A type of fish that can be found in Eastmarch. A type of fish that can be found in Grahtwood. 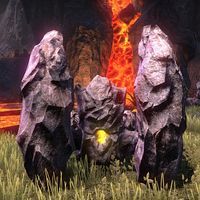 A type of Elemental Daedra consisting of four legs and a central body with one eye, all made out of stone. Pelladil Direnni of Clan Direnni summoned an army of Stone Atronachs to build the Blackrose Prison. A variant called the Foundation Stone Atronach is made out of carved Nedic architecture. A moderately strong Golem made out of stone. A powerful Shock Elemental Daedra native to a pocket realm of Oblivion called Levinace. 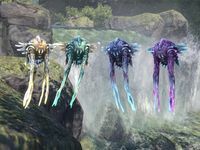 They can be summoned, and are immune to normal weapons and shock, resistant to poison and can reflect spells and damage. A type of fish that can be found in lakes on Auridon. Swamp Jellies are floating creatures with an elastic, gelatinous bodies that are native to Black Marsh. They are described as having a disquieting resemblance to aquatic jellyfish that natural philosophers have no adequate explanation for. They are extremely docile in nature and tend to live solitary lives from other swamp jelly, coming only together for spawn but are social animals. Their diet consists of bugs and make excellent travel companions for the marsh. Various swamp jelly breeds exist and while most of them are harmless, a few breeds from the deepmire are poisonous and can kill you even if you barely touch their tentacles. The breeds vary wildly in their size, shape, and colors. Argonians use flavor themed naming conventions based on a swamp jelly's color hue. 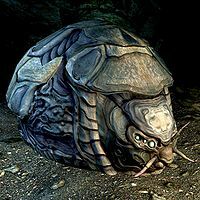 Four known varieties of Swamp Jellies can be found in Murkmire, and the Swamp Jellies of the region most commonly have frilled, bulbous bodies from which four tentacles hang. The cantaloupe swamp jelly breed is named after its amber hue and is observed to be the most common swamp jelly in the region. The mint swamp jelly breed is named after its green hue but coincidently has a refreshing taste. The blue swamp jelly breed has a blue hue but its flavor themed name is unknown. The plum swamp jelly breed is named after its violet hue and is the rarest breed. 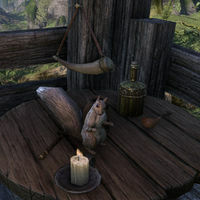 Seeing a plum swamp jelly is considered by many Argonians to be a sign of good fortune and Argonians wear their feeler as a "Good Luck Tentacle." They are related to the Netches of Morrowind. Some historians theorize that the relation may be a result of the Dark Elves raiding Black Marsh for thousands of years in an effort to bring back things they deemed valuable, such as slaves, livestock,and critters. 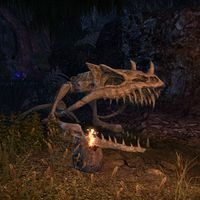 A creature found in the Black Marsh, it is described as a mountain of spines, with nine-foot-long claws and a jaw that juts out, exposing its tusks. 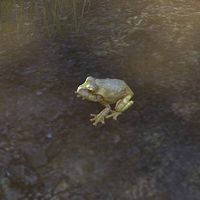 This Frog is an specially rare species found in Murkmire. They are pale green in color and dappled with gold, and are rarely seem, preferring to stay in their mud pits and only emerging to mate every few seasons. As their croaks are highly prized by Argonian vossa-satl makers, they developed a way to lure them out. This involves creating an artificial Toad Musk out of stench sedge, salt rush, and joymallow and applying it to a croak-wheel which mimics the mating croak of the Sun-Blessed Toad. They are also known to be quite fragile when excited. This page was last modified on 14 March 2019, at 01:06.